STEEPING is the first step of the malting process and at the same time the most important one. 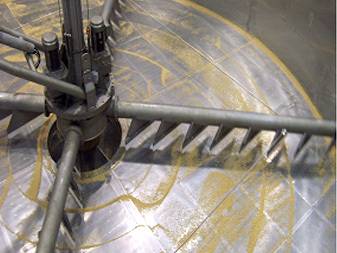 A major requirement for making good malt is the even distribution of moisture in the barley. Manufactured completely in stainless steel with automated washing and cleaning, the conical steeps provide a cost-effective and reliable method of steeping. The design allows optimal aeration and ventilation with larger bowl diameters for better access for cleaning. 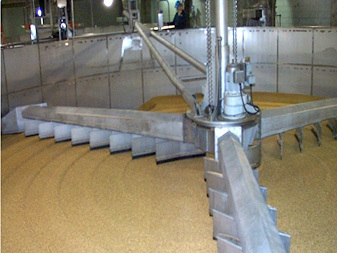 The total steeping period can be fully automated from the dry or wet transfer of barley to steep, this transfer can include pre-washing of the barley. The necessary number of wet / dry periods are followed by the transfer to germination. Flat bottom steeps are circular stainless steel vessels with perforated or wedge wire stainless steel floors. These vessels offer a high batch capacity with more even ventilation and aeration. The shallow plenum can be automatically washed and the easy lift system of floor plates allows access to the plenum for inspection. Loading and unloading of the Vessel can either be done by the Rota-Star, a rotating plough, or Rota-Lift, a rotating screw system. Flat bottomed steeps are offered for batch sizes up to 500 tones original barley.